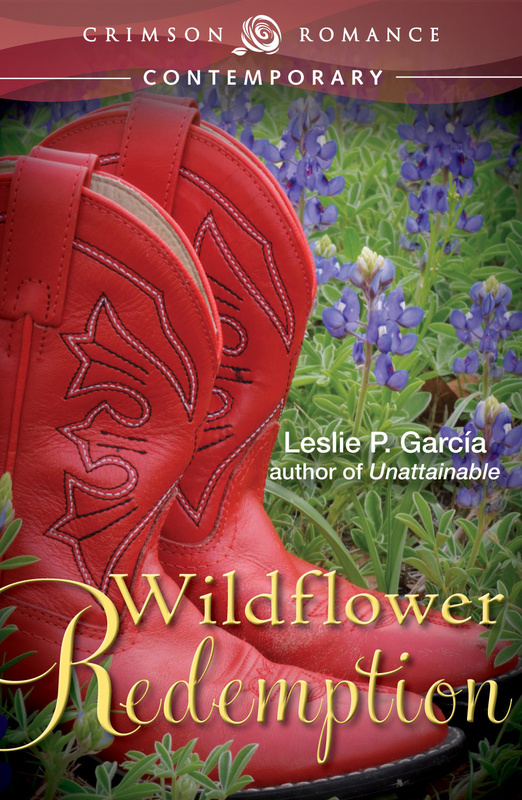 News that’s dear to my heart: Wildflower Redemption was released Dec. 9th by “my” publisher, Crimson Romance. (Sounds good to say that after so many years, right? Here’s an excerpt from Chapter One. If you enjoy it, links to purchase follow. Thanks for your interest, and support–and remember that we authors often live and die (in the literary sense!) on the reviews you’re kind enough to post, especially, for some reason, on Amazon! Aaron Estes stood at the window, one hand pulling back the drapes to clear his view. Outside, clouds hovered along the horizon, but he doubted it would rain. Aaron had shrugged and told the man politely that he didn’t need help. And he didn’t—at least, not physical help. Spiritual help, maybe, mental health—the kind of health that comes with peace and contentment. The kind of health he’d probably never find again. He closed his eyes and listened for any sound of six-year-old Chloe waking, but heard only silence. Unwelcome memories tried to push in, and he pressed his lids tighter against his face, unwilling to give in again to the pain. The memories came anyway: the loud, angry words of a marriage shattering. The cheery morning greeting from the one thing he and Stella still shared—a tiny, precious miracle of motion and light. Chloe’s loud kiss and plaintive complaint when her mother tried to leave without kissing Aaron goodbye hovered near the surface. He could still feel Chloe’s huge kiss on his cheeks, hear the petulance in her voice when her mother tried to step around them. “Mommy, you forgot Daddy’s kiss.” Stella pecked him on the cheek, and Chloe tugged on her mom’s blouse. With lips so tight he could feel her anger, Stella stood on tiptoe and touched her mouth to his. Then he watched as Chloe grabbed her mother’s hand, delighted that she was playing mom today, not cop. To Chloe, the world was a game, and everyone in it, players. He closed his eyes, but the burning didn’t go away, so he went back to staring blindly outside. There were no daffodils here, as there were in Alabama, but he heard that just miles north spring came in on carpets of bluebonnets and waves of flaming Indian paintbrush. All the locals raved about the Texas wildflowers. They said he should go see them, but he knew he couldn’t. The scene he’d rushed to just over a year ago crowded in: the hysteria, the cop cars with their flashing red and blue lights; the crumpled body of a child, an injured teacher being wheeled toward an ambulance; and an officer who knew Stella pulling him aside. She’d taken a bullet for a kid, the officer told him. Unfaithful, maybe, arrogant often—but nobody doubted Stella Estes’ courage. The tears rolled down his cheeks and he wiped them away with the back of his hand, trying not to remember that there’d been blood on the daffodils the day the world ended. Where to find your copy? We live in a rush, right? Whether we visit sites as readers, authors, or just folks looking for something undetermined, we only have so much time. Logically, I understand that. But I’m one of those “an inch wide and a mile deep” people–blame it on teaching and the one year that was the buzz phrase. So you’ll catch interviews and blogs on , but here–you can read more. So now that you’ve met Melinda Dozier, why not find out a little more about her and her hot new romance, Breaking the Rules? What happens in the air doesn’t stay up there. Once on tropical land, Kate believes that the handsome stranger who gave her the best kiss of her life is now her new client, Drew Cannon, fiancé to the beautiful and wealthy Lauren Kincaid. 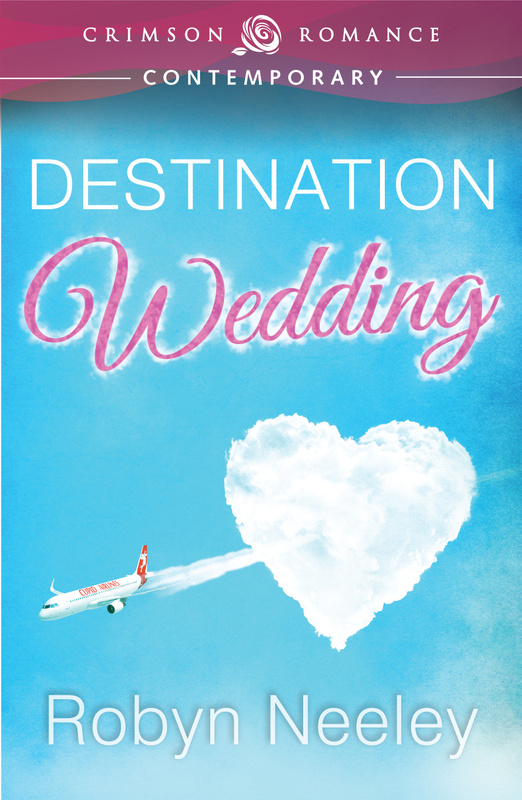 While Kate struggles with the intense feelings she thinks she has for Drew, Luke discovers Kate’s been hired to plan his brother’s destination wedding. He also realizes the initial sparks they shared 30,000 feet up are now mistakenly aimed at Drew. “I do. I do.” Wedding planner Kate Ashby quietly repeated her calming mantra. Paralyzed in her window seat, she stared at the illuminated fasten seatbelt sign while her hands gripped the metal buckle strap. Please turn off. Please turn off. They had to be close to cruising altitude. Soon, she’d be able to request a strong drink to knock her out for the duration of this bumpy flight. She sat still, trying to ignore the terror pulsating through her. Why hadn’t she bought sleeping pills before boarding a twelve-hour flight from New York City to Hawaii? Now, that would have been the smart thing to do. Glancing out the tiny passenger window, she clutched her gold “K” necklace. It was completely irrational to be terrified and she realized the odds of her and her fellow passengers landing safely in Honolulu were more than in her favor. Still, this was her first time flying such a long duration. Departing Manhattan this evening in turbulent thunderstorms had shot her nerves. She was grateful that her boss had sprung for a first class ticket for the long flight. A loud rattle caused her to grab hold to her armrests. “What was that?” She turned to the stranger sitting next to her. He had short blondish brown hair and was wearing a blue blazer. His face had a nice tan. She had failed to realize that her row mate was incredibly handsome. Usually the person sitting next to her was a grandparent or couldn’t speak English. Perhaps he could help her ease her nerves? “Um … I think it’s the drink cart. Would you like something?” He folded his Wall Street Journal. “I’ll take a tequila and tonic,” he said to the flight attendant. And likes his drinks strong. This could be fun. 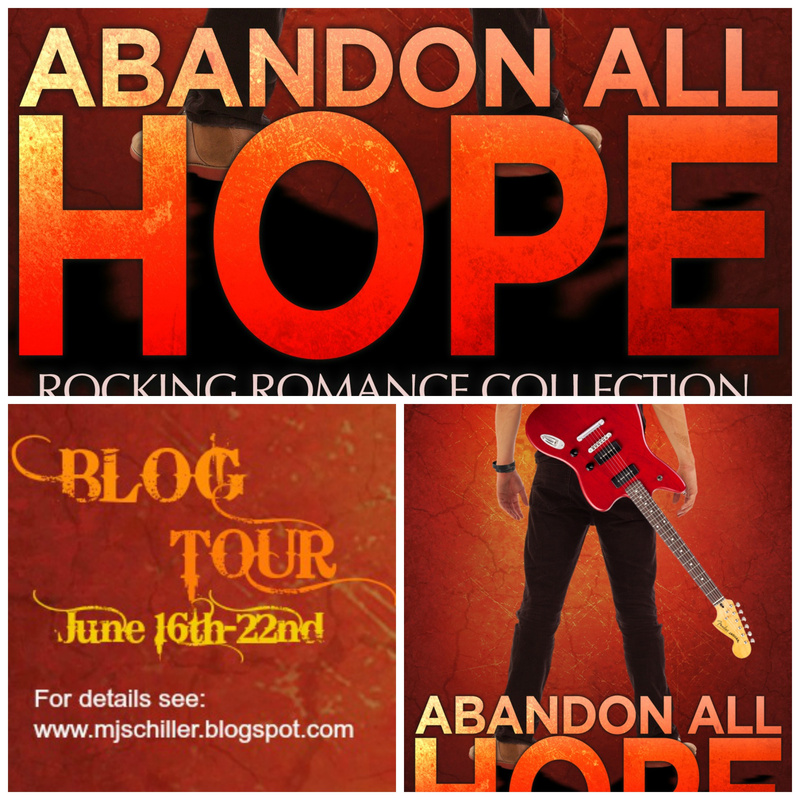 Find out more about rockin’ author and self-proclaimed lunch lady MJ Schiller after you read her interview. 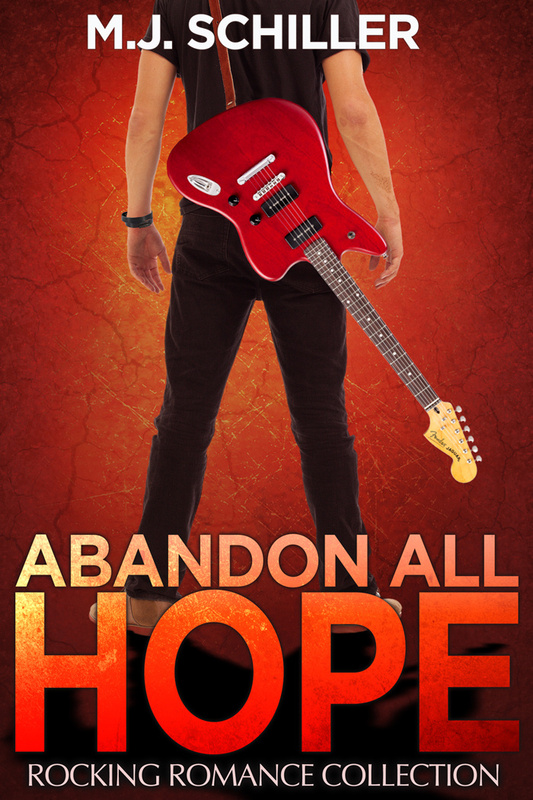 MJ’s bio, and the blurb and an excerpt for Abandon All Hope follow! I was born in Overland Park, KS, in the heart of Tornado Alley, and my life has been a bit twisted since. Actually, it’s not all that twisted, but I’ve always wanted to use that line. I grew up in St. Louis, MO, went to school at the University of Missouri-Columbia, and moved to Bloomington, IL, fresh out of college, after my husband got a job at State Farm’s corporate headquarters. I’ve worked as a high school/junior college teacher, personnel recruiter, office manager of a jewelry store, and, for the past ten years, as a lunch lady. I like to karaoke and attend rock concerts. I am actively involved at church and spend too much time on Facebook. I am the mother of a seventeen-year-old, and fifteen-year-old triplets, and have been married to my husband, Don, for over twenty-four years. He was…ten…no, twelve. Definitely twelve, as he was playing American Junior League baseball that summer. There had been a break in the team’s schedule, so his mom had asked the new neighbor lady over for dinner, along with her twelve-year-old kid. He was told he couldn’t go over to Bobby McGraw’s to play catch. He was needed at home to entertain, of all things, the new neighbor’s daughter. A girl. Chase sat on the back porch steps smacking a ball into his glove over and over. In his frustration, he dropped the ball. It hit the edge of the step, and ricocheted, rolling down the small slope of their backyard. He glanced up and saw them crossing the lawn. Mrs. Creswell had on a dress; she had no doubt worn it to work and had just gotten home. Hope wore cutoff jean shorts and a blue, checkered, sleeveless blouse tied at her waist. She held a present, and as she walked, a long ponytail swished behind her in a somewhat mesmerizing rhythm. The sun was just beginning its descent behind the pair. Chase held up a hand and squinted, wrinkling his freckled nose. The sun rays seemed to be shooting off the two, as if they, themselves, were the source of the bright light. Hope bent down and picked up his ball. He heard the familiar sound of the screen door opening behind him: his mom coming to greet their guests. She was probably wiping her hands on an apron as she descended the steps, blond hair swept up in a loose bun. The smell of her famous fried chicken wafted out the door and his stomach rumbled on cue. “Oh, wow! Cool!” Chase gushed, unveiling a model airplane. An Albatros D.V. Diecast Model German Air Force Jasta 11, also known as “The Red Baron.” It was the sweetest model he had ever seen.